In July 1952, Philomena Lee gave birth to a son at a convent in Ireland. Her parents had disowned her upon discovering that their unmarried teenage daughter was pregnant, so she lived out the next few years of her life at that convent with other young women of the same situation. When her child, Anthony, was three, he was adopted. Philomena did not have the opportunity to say goodbye, nor did she even know until the car drove off the premises with her child, a standard event in those days. Fifty years later, and now a retired nurse, she begins to tell her family about this episode of her life, something she had never done before. This story falls on the ears of Martin Sixsmith, a man who had previously worked as a journalist for the BBC and a spin doctor for Tony Blair’s government. Initially uninterested (he wants to write about Russian history), Sixsmith soon agrees to look at what initially appears to be little more than a mere human interest story, and find out the details of what happened to this woman’s son. This is the basis of Philomena, based on a true story, and Stephen Frear’s newest film. Judi Dench plays Lee in the 21st century, Sophie Kennedy Clark as a teenager in flashbacks. Steve Coogan, also a co-writer and producer, plays Sixsmith, who wrote the source material, a 2009 book called “The Lost Child of Philomena Lee”. Featuring astoundingly good acting and a well paced screenplay with a couple handfuls of wit, this is a worthwhile movie. 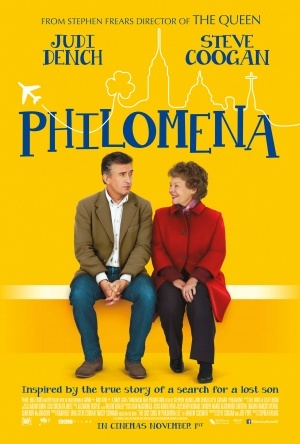 Most of the film centers around the search for Philomena’s son Anthony, whose name was changed to Michael Hess following his adoption. We find out that the Ronald Reagan and George H.W. Bush presidencies included Anthony/Michael as a close employee, and Sixsmith had even met him during his reporter days. This life in D.C. working for high profile people sounds interesting, but the details of it are given little attention. I would have liked it if this 98 minute drama had focused some more time on giving a deeper look at his life. By all accounts, Martin Sixsmith’s book includes more of this kind of information that he came across. Nevertheless, what we have is solid. Dench is at the center of the picture, and she carries it marvelously, as she so often has done in the past. Her brilliant performance currently has a comfortable resting spot on the predictions of Best Actress Oscar nominations, and such a nod would be certainly deserved. Coogan serves as a formidable co-star, portraying Sixsmith with an intrepid journalistic instinct alongside a fair sheet of sarcasm and dry humor, at times possibly too much so for his own good. 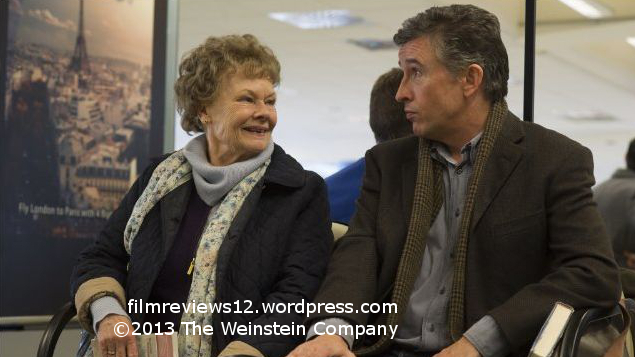 Philomena is a thoughtful and emotional film, well written and acted. It does not spend any time blindly antagonizing or generalizing, and instead focuses on ambition and the strength of the human will throughout obstacles, embodied in two interesting yet flawed characters (Martin is too impersonal, Philomena the opposite). Despite its errors in the way it divided its attention, there is still a very recommendable film to be had.